BIGFOOT The largest dinosaur foot fossil yet found may belong to a long-necked brachiosaur (illustrated) from the late Jurassic Period. One dino is putting its biggest foot forward. A nearly meter-wide fossilized dinosaur foot, unearthed 20 years ago from mudstone in northeastern Wyoming, is the largest yet found, an international team of researchers reports July 24 in PeerJ. The rest of the dino’s skeleton has yet to be identified, but the size and shape of the foot bones indicate that it once belonged to a brachiosaur. 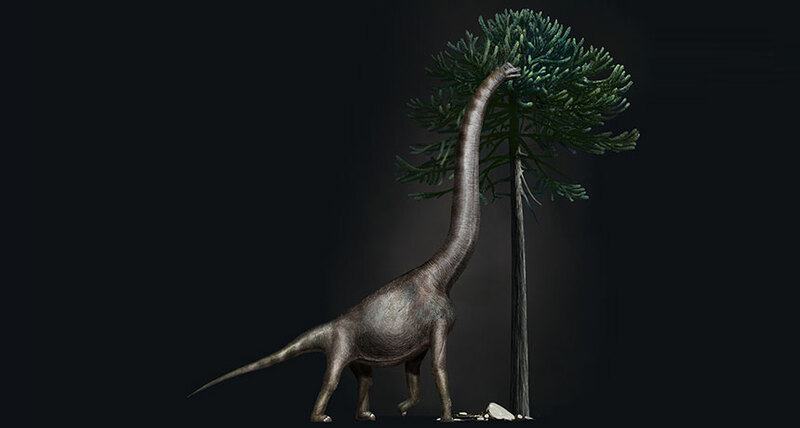 These long-necked herbivores lived about 150 million years ago, during the late Jurassic Period. P“These things were just huge,” says study coauthor David Burnham, a paleontologist at the University of Kansas Biodiversity Institute and Natural History Museum in Lawrence. He estimates that the new dino — nicknamed Bigfoot — may have been about 30 meters long, or roughly the length of a blue whale.